Jean-Michel Cousteau, explorer, environmentalist, educator and film producer, will share his experiences during the second Kohlenberg Lyceum event of the semester at 7:30 p.m. Oct. 21 in Baldwin Auditorium. For more than four decades, Cousteau has used his vast experience to communicate his love and concern for the earth and its water with people of all nations and generations. Cousteau began exploring the ocean realm at the age of seven when his father “threw him overboard” with newly invented scuba gear on his back. The son of ocean explorer Jacques Cousteau, he spent much of his life with his family exploring the world’s oceans. 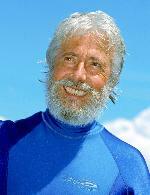 After his mother’s death in 1990 and his father’s death in 1997, Cousteau founded Ocean Futures Society. He formed the non-profit marine conservation and education organization in 1999 in order to carry on the pioneering work of his family. Cousteau serves as president of the society. Cousteau is an impassioned spokesman and diplomat for the environment, and he reaches out to the public through a variety of media. He has produced more than 70 films and has received numerous awards: the Emmy, the Peabody Award, the 7 d’Or (the French equivalent of the Emmy) and the Cable ACE Award. In addition to his awards for film, his book, “Jean-Michel Cousteau’s America’s Underwater Treasures,” has received two prestigious awards in the independent publishing world, the 2008 Benjamin Franklin Bill Fisher Award for Best First Book (Non-Fiction) and the 2008 IPPY Gold Medal Award for best book in the environment/ecology/nature category. Acting on a childhood dream to build cities under the sea, Cousteau pursued a degree in architecture and graduated from the Paris School of Architecture in 1964. Recently, he has worked with the Jean-Michel Cousteau Fiji Islands Resort, designed to demonstrate an environmentally responsible and culturally appropriate ocean-oriented resort. Tickets for Cousteau’s presentation are on sale now. Students can pick up their free ticket by presenting a Truman ID at the Student Activities Board Box Office, located in the lower level of the Student Union Building. Faculty and staff can receive their free tickets by showing their Truman ID at the Information Center in the Student Union Building. General admission tickets cost $7 for adults and $4 for those 18 and under and can be purchased downtown at Edna Campbell’s or at the Truman Cashier’s Window in McClain Hall. Sodexo, Residence Life and the United Way are teaming up again this year for the 2009 Food Fast. During the week of Oct. 19-24, students will be able to donate meals, dining dollars and bonus bucks to the United Way. Donations can be made at any of the residence hall cafeterias, with student advisers or online at http://reslife.truman.edu. Last year, students donated more than $5,000 through the Food Fast, which helped to exceed Truman’s campaign goal of $56,000. This year, Truman’s goal is again set at $56,000. The United Way is an invaluable organization in Adair County and the greater Northeast Missouri community. Money raised for the United Way is used to fund programs and agencies that benefit the local community, including: the Boy Scouts, the Girl Scouts, the American Red Cross, the Salvation Army, Victim Support Services, Hospice and more. For questions about the Food Fast, or other forms of pledging to Truman’s United Way campaign, contact co-chairs Joe Hamilton (hamilton@truman.edu), Deb Kerby (dkerby@truman.edu) or Elise Bailey (emb970@truman.edu). The 2009 Truman State University New Music Festival, taking place Oct. 29-30, will include two free public concerts featuring music by three guest composers and eight local composers, performed by more than 200 musicians. Six world premiere performances will also be included. Guest composers include: Vivian Fung, winner of the international 2009 Truman State-MACRO Composition Competition; John Mayrose, winner of the international 2009 Percussive Arts Society Competition; and Randy Haldeman, internationally-recognized composer, conductor and clinician of choral music. Fung teaches at The Juilliard School of Music and has gained a prominent worldwide reputation for her stirring and highly original music, which reflects her interest in world cultures. Mayrose has taught music and electronic music courses at Duke University. His work is widely performed and has gained international recognition. Haldeman, director of choral studies at the University or North Carolina-Charlotte, is widely respected as a composer, performer and conductor. All three composers have extensive performance histories and have been recipients of many awards and prestigious commissions. Concert I of the New Music Festival will take place at 7 p.m. Oct. 29 in the Ophelia Parrish Performance Hall. The concert will feature music by all three guest composers, including premieres of newly-commissioned works composed by Fung and Mayrose. Truman ensembles performing that evening will include the Clarinet Choir, Percussion Ensemble I, Wind Symphony I, the President’s String Quartet and two choirs—Cantoria and the Chamber Choir. Concert II will take place at 1:30 p.m. Oct. 30, also in the Ophelia Parrish Performance Hall. The concert will feature acoustic and electronic music by Fung and by seven local composers and will be performed by Truman faculty and students. The festival is sponsored by the Epsilon Pi chapter of Sigma Alpha Iota, the Upsilon Phi chapter of Phi Mu Alpha Sinfonia, the Mostly Live Composers Society and the Truman Department of Music. For more information contact Warren Gooch at 785.4429 or wgooch@truman.edu. 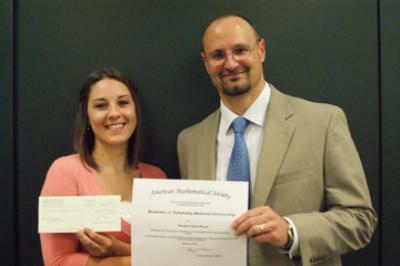 Kendall Brown, a sophomore mathematics major from St. Charles, Mo., was recently awarded a $3,000 Waldemar J. Trjitzinsky Memorial Scholarship, given through the American Mathematical Society to a Truman State University mathematics major. The certificate and check were presented to Brown Sept. 24 by Jon Gering, dean of the College of Science and Mathematics, at a luncheon organized for mathematics students and faculty by Kappa Mu Epsilon, the honorary mathematics fraternity. Brown is also the current president of Kappa Mu Epsilon. Nine McNair Scholars traveled to Kansas City, Mo., Sept. 25-27 to present their research at the 13th Annual Missouri-Kansas-Nebraska McNair Heartland Research Conference. Truman McNair Scholars at the Missouri-Kansas-Nebraska McNair Heartland Research Conference in Kansas City, Mo. The conference program included individual student research presentations, a graduate school recruitment fair and speakers who provided useful information about application to, and strategies for success in, graduate school. Kia (Hartfield) Johnson, Truman McNair alumna, was invited to be the keynote speaker at the conference. Recently, Johnson was awarded both the MO-KAN-NE and MAEOPP 2009 TRIO Achiever Awards for recognition of her civic and professional contributions. Truman McNair Alumna Laura Casey was awarded the MKN Heartland Scholarship, which is given to a past presenter who is currently enrolled in graduate school. Laura is a second-year student in the political science doctoral program at the University of Michigan-Ann Arbor. 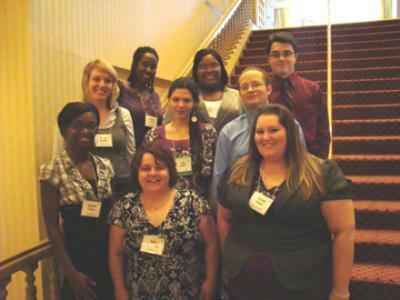 Truman’s student chapter of the American Chemical Society (ACS) was honored as an Outstanding Chapter for the 2008-09 academic year. This is the fifth time since 2004 that the chapter has been honored by the national organization and the third time they have received the highest award offered by ACS. Truman’s ACS students were also honored for their dedication to the environment by the Green Chemistry Student Chapter Award. Both of these awards recognize the incredible work of ACS students throughout the past year, including their outreach activities to the community, National Chemistry Week and the annual Musical Demo Show. Truman’s ACS presidents for the 2008-09 academic year were Dmitriy Chernookiy and Josh Blechle. The students, advised by Barbara Kramer, associate professor of chemistry, will travel to the National ACS meeting in San Francisco in the spring to receive the awards. The Missouri Travel Council will offer two $1,000 scholarships to currently enrolled sophomores, juniors or seniors in an accredited college or university in the state of Missouri. Applicants must be pursuing a hospitality related major such as hotel/restaurant management, parks and recreation, etc., must be a current resident of Missouri, and must have a grade point average of at least 3.0. To obtain further information about how to apply for this scholarship, go to http://www.missouritravel.com. The deadline for applications is March 2, 2010. Ryan Gregg, who graduated from Truman in 1999 with a degree in art history, will return to campus for a public lecture and to meet with students. Since graduating from Truman, Gregg has worked at the Art Institute of Chicago, earned a master's degree from Virginia Commonwealth University, and received his Ph.D. in Italian Renaissance Art History from Johns Hopkins University. He currently teaches Art History at Webster University in St. Louis. During his visit Gregg will meet with art history and other students as well as with the student club Art History Society. In addition, he will give a public lecture about his research, entitled “False Advertising in the Renaissance: Fabricating Military Architecture in Images of Siege Warfare,” at 6 p.m. Oct. 19 in Ophelia Parrish 2210. His presentation is free and open to the public. It was common practice in the Renaissance to include a bird's-eye view of a city in images of warfare. Such images normally offered a recognizable portrait of the city. Occasionally, however, artists would alter or embellish a city's fortifications for propagandistic purposes. This paper, after first explaining how such city views were made, will discuss an example by the Florentine artist Giorgio Vasari of such fabrication, found in his painting in the Palazzo Vecchio in Florence celebrating Europe's 1532 defense of Vienna against the Islamic Ottoman Empire—a battle that never actually occurred. For the third time this decade, the National Debate Team of the United Kingdom will visit Truman as part of its annual tour of United States colleges and universities. They will challenge debaters from the Truman Forensic Union in an exhibition debate on the topic “Resolved: China represents more of a threat than an opportunity” at 7 p.m. Oct. 20 in the Ophelia Parrish Performance Hall. Admission is free and open to the public. The British recommended the topic and they will affirm the resolution, as Truman’s debaters negate it. The English Speaking Union in London selected the British debaters and the Committee for International Discussion and Debate (CIDD) of the National Communication Association is sponsoring the team. In total, the debaters are visiting 26 colleges, universities and high schools from mid-September to mid-November. Truman is one of three Missouri institutions the British will visit, including Washington University in St. Louis and Metropolitan Community College-Longview in Lee’s Summit. The visiting debaters are Dan Bradley and Andrew Tuffin. As is customary in the United Kingdom, the debaters already hold graduate degrees. Bradley, a former president of the Manchester Debating Union and the Northern and Midlands Debating Alliance, is in the process of submitting his thesis for a Ph.D. in chemistry from the University of Manchester. He previously held an internship on climate change policy at the Houses of Parliament. Bradley said he “took up university debating after I became fed up of losing arguments in pubs to a friend who was Convener of Debates at Glasgow University.” Over the course of his Ph.D. he competed in more than 75 competitions, reaching the semi-finals of the World University Debating Championships, and was one of the top 10 speakers at the European Championships. Andrew Tuffin is as an active debater on the European universities’ debating circuit. He received a Master of Arts in Philosophy from King’s College, London, and also read history as an undergraduate at the University of Manchester. He took up debating two years ago because a broken foot had made him “a pretty ineffective member of the university hockey team.” Since then he has won inter-varsity tournaments, picked up individual speaker awards, and acted as the Chief Adjudicator at competitions on the British university circuit. He is also involved in the English Speaking Union’s High School debate program, which endeavors to broaden students’ horizons, build their confidence and, as Tuffin puts it, “teach them how to talk back to their teachers without getting into too much trouble.” Tuffin has previously worked as a teacher in India and Nepal. Junior political science major, Sarah Backhaus (Liberty, Mo.) and sophomore political science major, Christian Johns (Carthage, Mo.) will represent Truman. Backhaus has represented Truman at three consecutive national championship tournaments, and Johns reached the sweet sixteen of the national tournament as a freshman last season. Both are having highly successful seasons this year, and both have already secured qualifications to the national championships in April. The visiting team is sponsored by Pi Kappa Delta, a National Forensics Honor Society, with financial support from the Funds Allotment Council. The Truman Institute and faculty of the Department of Communication have provided logistical support. For more information on the event, contact Kevin Minch at kminch@truman.edu or 785.5384. Career Expo is finally here. On Oct. 21 from 11 a.m.-4 p.m. in the Student Union Building, companies who are hiring accounting, nursing, health and exercise science, business, communication, biology, chemistry, computer science, education, criminal justice, psychology and all other majors, will be ready to speak with Truman students about internship and job opportunities. Some companies are signing up students to interview on campus Oct. 22. Plan to attend Career Expo and begin your networking. Admission will be free, but non-perishable food and/or monetary donations are encouraged. Stop by the SERVE table in the Student Union Building from Monday through Friday to find out more information about the week’s events, or contact the SERVE team at serve@truman.edu. Students may fill out and submit applications online. The applications are due by midnight Nov. 1. To learn more, go to http://www.truman.edu and click on Student Life/Money/FoundationScholarships or visit https://secure.truman.edu/isupport-s/. The McNair Program is currently accepting applications for participation in the program. Go to http://mcnair.truman.edu for the application and information about eligibility, or call Sarah Hass at 785.5393. Students who want to learn more about a major in accounting or business administration, or a minor in business, should attend. Information will also be available on the new international business concentration. Refreshments will be served. Beta Theta Pi is offering two $250 Men of Principle Scholarships for those interested in rushing in the spring. The scholarship does not commit membership to Beta Theta Pi or any other organization. Deadline to apply is 11:59 p.m. Nov. 11. Interviews will take place in December. Applications are available online at http://www.zeta-xi.com/rush/men_of_principle_scholarship. For more information, contact Jon Grush at jmg6242@truman.edu. All proceeds benefit the American Heart Association. Sponsored by the SERVE Center, A.T. Still University and Northeast Regional Medical Center. Truman’s Staff Council is collecting hats, scarves, gloves, mittens and boots. Items can be donated in designated boxes located in the Student Union Building, the Career Center, Pickler Memorial Library, the Physical Plant Office, the Barnett Hall lobby and the McClain Hall lobby. Apple cider, hot chocolate, festive food, Halloween music and more. A limited number of small and medium Truman Spirit Shirts are still available for $5 in the Public Relations Office at McClain Hall 101. As a continuing part of the Lincoln Bicentennial Celebration, Pickler Memorial Library is featuring a new gallery exhibit which focuses on the concept of freedom. Including a colorful panel exhibit from the Gilder Lehrman Institute of American History, along with a number of authentic documents from both the Revolutionary and Civil Wars, this exhibit showcases the struggle for individual liberty and engenders a sense of the heartache, as well as the triumphs, that brought about the freedom Americans enjoy today. Faculty from the School of Science and Mathematics recently received a $15,000 grant from the NASA-Missouri Space Grant Consortium titled “Establishing a Multidisciplinary Astrobiology Research Community.” Matthew Beaky, associate professor of physics, Laura Fielden, associate professor of biology, Eric Patterson, associate professor of chemistry, and Maria Nagan, associate professor of chemistry, will gather a team of students to collaborate on astrobiology research projects and take field trips to astronomy and astrobiology oriented sites. Michael Bump, associate professor of music/percussion studies, recently served as the U.S. representative on a three-member adjudication panel for the 2009 Percussive Arts Society International Composition Competition. Michael Goggin, associate professor of physics, and collaborators at the University of Illinois at Urbana-Champaign (UIUC) recently had their paper “Optimizing type-I polarization-entangled photons,” published in Optics Express. The article is based on work done by Goggin while on sabbatical at UIUC and may be found online at http://www.opticsinfobase.org/oe/abstract.cfm?uri=oe-17-21-18920. Jerrold Hirsch, professor of history, chaired a session on progressivism and responded to the papers in his comments, “A New Realism: Progressivism Reassessed,” at the Mid-America Conference on History in Norman, Okla., Oct.1-3. Todd Phillips, director of the Student Success Center, recently had his proposal accepted by the College Reading and Learning Association, a learning assistance professional organization. In addition, Phillips will have a chapter published next spring in the 2010 International Tutor Training manual for the International Tutor Training Program. Phillips’ chapter discusses using technology for tutor training. Editor Robert Fussell and the Truman State University Press were awarded the 2009 Will Rogers Medallion Award for the book, “Unbridled Cowboy.” The award honors books that represent an outstanding achievement in the publishing of western media. The winning books exemplify a combination of excellent content, high production values, and respect for cowboy heritage. Fussell’s grandfather, Joseph Fussell, wrote the true-life narrative of his life in the American Southwest in the late 1800s. Truman State University Press published the book in 2008. Applications for the Missouri Government Internship at the Capitol in Jefferson City, Mo., are available in the Public Relations Office in McClain Hall 101 or online at http://career.truman.edu/Internships/mogovBrochure.asp. Peter Rolnick, professor of physics, will present “Searching for a Maternal Effect in Paramecium Population Dynamics,” at 4:30 p.m. Oct. 21 in Violette Hall 1000 as part of a Physics and Biology Joint Colloquium. After a little background, Rolnick will discuss experiments he and his students are doing to compare the importance of predator-prey and maternal effects in the population dynamics of Paramecium. Snacks are provided five minutes before the talk. For more information about our colloquium series and upcoming talks, please visit: http://physics.truman.edu/colloquia/mainstage.asp. The Local Foods Supper will take place from 7-9:30 p.m. Oct. 26 in the Student Union Building Georgian Rooms A and B. The dinner will feature delicious local, seasonal foods (with vegetarian options) and will be also feature discussion tables. The Agriculture Department is selling Bulldog Bistro Cookbooks for $10. Contact Michael Seipel at mseipel@truman.edu.